The experiments of Baron Frankenstein and his assistant Hans at a watermill are disrupted by a priest after a child sees their body snatcher steal the corpse of one of her recently dead relatives. The two flee to the Baron’s hometown of Karlstaad, from where he was expelled ten years ago after creating a creature from human parts which fell into a crevice when shot by pursuers. His chateau has been looted but the laboratory is intact. He also discovers that the corrupt Burgomaster and Chief of Police have stolen many of the house’s belongings. Guided by a deaf-mute beggar girl to a cave in the mountains, Frankenstein finds his old creature, trapped in ice…. 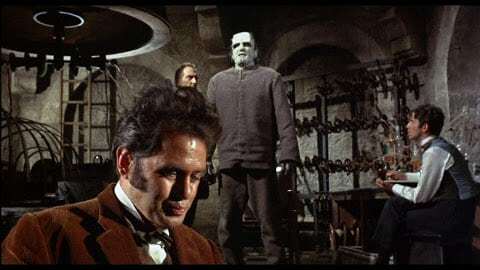 Watching The Evil Of Frankenstein is always a slightly strange experience for me as, despite it being in colour, it feels like I’m viewing an older Universal Frankenstein picture. Hammer’s distribution deal with Universal allowed them to use Universal material, so here we have a film that not only borrows a lot of elements from the Universal films [there’s even a burgomaster] and feels a bit different to the previous two Hammer Frankensteins, but also seems to exist in a different universe, what with – for a start – the complete ignorance of the ending of The Revenge Of Frankenstein where the good Baron has a new identity. 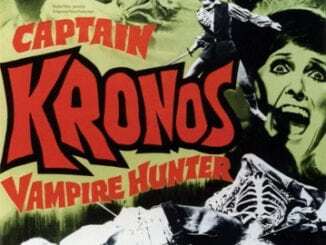 It therefore lacks their freshness and doesn’t really attempt to try anything new anything new like those films did, but it’s a much livelier affair and isn’t really worth the derision it tends to get [I can certainly think of one Hammer Frankenstein that’s worse], even if it’s fairly minor Hammer overall. 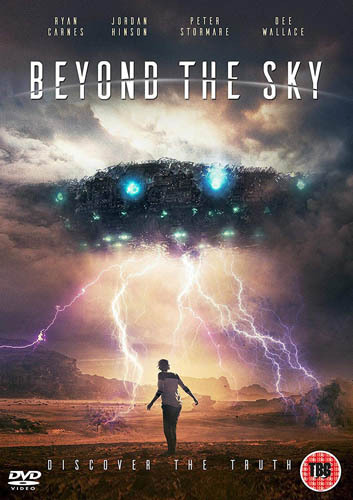 I always enjoy watching it, even if there’s not much to it really and the story isn’t developed in interesting ways. 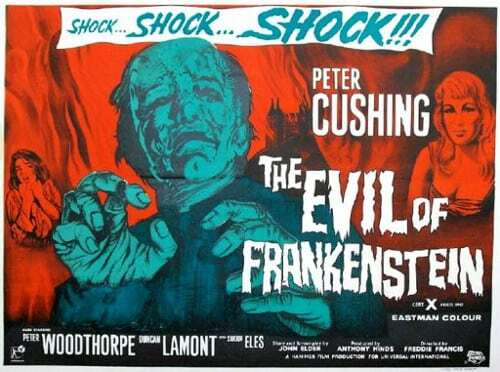 Though its screenplay is credited to John Elder [the pseudonym of Anthony Hinds], the origins of The Evil Of Frankenstein lie in a script, written by Henry Kuttner and C.L. Moore, for an episode called The Hypnotist of a proposed Hammer/Universal TV series in 1958 called Tales Of Frankenstein which only had one episode made before being cancelled. 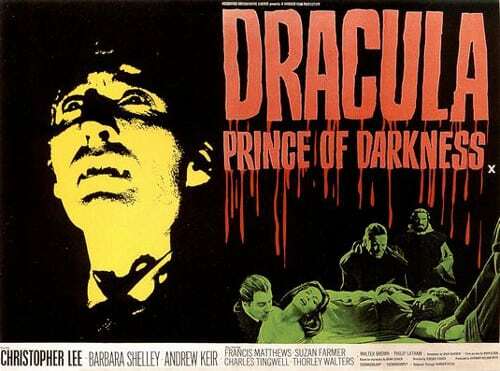 The film was developed for Columbia in 1964 and Terence Fisher was slated to direct, but had to bow out after a car crash, so Freddie Francis was asked but only accepted if a large laboratory set could be built. 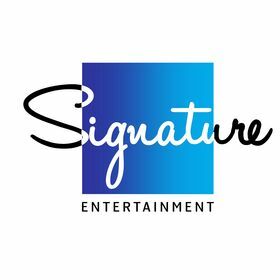 By this time Universal were the co-financiers and US distributors. Makeup man Roy Ashton did nearly 200 drawings of the face of Frankenstein’s creation as Hammer didn’t seem to know what they wanted. Peter Cushing got third degree burns when he insisted on jumping off a balcony near a fire himself. The film was shot at Bray, Black Park, Oakley Court, and nearby Monkey Island Lane. 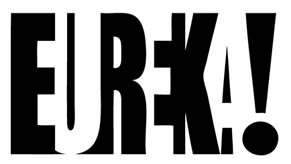 The BBFC insisted that the murder of the Burgomaster be shortened and the sounds of Frankenstein cutting through skin and bone be removed from the opening title sequence. 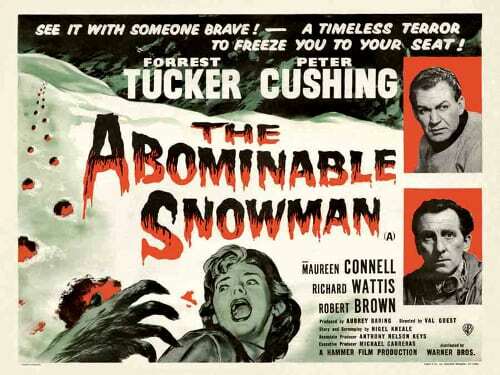 Double billed with Nightmare, this film was much more commercially successful in the US than the UK. Like Kiss Of The Vampire and The Phantom Of The Opera, it had new footage [13 min] added for a TV version, in this case footage of the beggar girl [old shots edited in] being traumatized by the monster [shown only by his feet], becoming deaf and mute as a result, the girl’s father, and a reporter. This material can actually be seen on YouTube and I don’t know why it didn’t make into the film’s Blu-ray release. Though this one generally doesn’t seem to try to frighten, the opening scene is rather effective as a little girl sees the body of one of her relatives taken away by the body snatcher, with good use of shadows and the movement of the body shown by just his legs and feet being moved….whereupon the girl flees and runs into somebody….who turns out to be Frankenstein. The titles then play over Frankenstein cutting open the body’s stomach and removing the heart below the frame. He soon has to do a runner though and flees to his old home of Karlstadt. He tells his assistant Hans about what happened ten years ago….but rather than having footage from The Curse Of Frankenstein, we have all-new stuff featuring a different Creature. Obviously Hammer didn’t give a damn about continuity, which is why it’s perhaps best to pretend that this film takes place in a different universe to the others. The lengthy flashback is well done though, with a cracking creation scene, the Creature actually being unable to support himself and walk properly at first for a change, and the gruesome sight of several dead sheep as the Creature, while not a killer of humans [yet], has a taste for meat. The Creature is shot and falls over a crevice….but of course we know he’s not dead, don’t we? 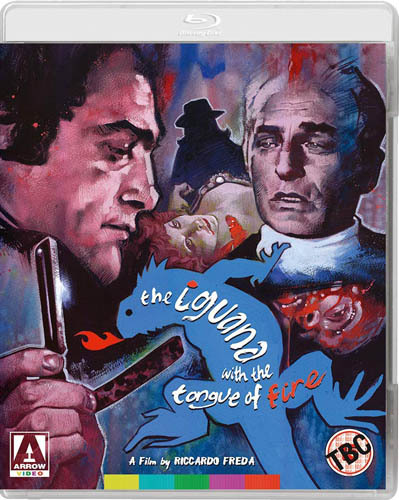 The problem with the afore-mentioned flashback being so long is that the main part of the story doesn’t really have enough time in which to unfold, though the pace is fast as Frankenstein finds out that the Burgomaster and Chief of Police have taken most of the things in the house, and Cushing is given an amusing escape scene where he ties bed sheets to a bed post and swings out through a window….dragging the bed, which contains the Burgomaster’s young buxom wife, along the floor. 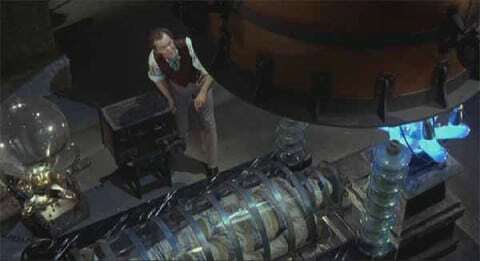 As in House Of Frankenstein, the Creature is found underground encased in ice, and then, when a hypnotist named Zoltan is required to make the Creature functional after he’s revived but his damaged brain renders him inactive, the villain sends the Creature out to do his dirty work, just like Ygor in Son Of Frankenstein. 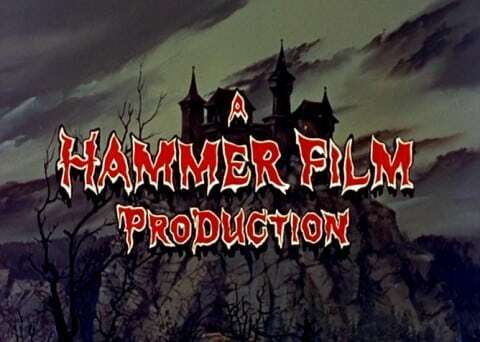 As with several other Hammers of this period, the plot has to rush to its conclusion without enough time for it to play out naturally, though the fiery climax is well enough done. Funny how the laboratory and the people who are still in it are burnt to a crisp just before the Universal-style torch bearing villagers turn up, thereby rendering them ineffectual. The killing of the Burgomaster is effectively brutal as he’s bashed against a wall several times, but it’s notable how tame The Evil Of Frankenstein is compared to its two predecessors [the only medical detail we see is a heart], though this was mostly due to the BBFC who were far stricter on horror content at the time it was made [though not, it seems, on things like the James Bond films which garnered ‘A’ [‘PG’] ratings despite their violent and sexual content which, as Christopher Lee once pointed out, was stronger than some of the Hammer horrors]. While there seems to be a theme running through the film of humankind destroying things it doesn’t understand, the Creature in this film is little more than a super strong brute, with none of the pathos inherent in Lee’s Creature, and played blandly by wrestler Kiwi Kingston, though his makeup isn’t bad, being obviously inspired by the iconic Jack Pierce design but sufficiently different from it to stand on its own merits. Frankenstein is far less villainous than before, the real ‘nasty’ of the film being the alcoholic, greedy and power-mad Zoltan. He often terrorises the [unnamed] beggar girl, who you know is eventually going to find her voice through screaming in terror, though I was surprised that she doesn’t have a romance with Hans, who doesn’t really have a character except blindly following Frankenstein everywhere for “knowledge”. Francis obviously wasn’t invested very much in this project like he was in Paranoiac and Nightmare, so it doesn’t have the visual flair of those two films, though the laboratory set, combining the usual Hammer ingredients with elements of the ones in the old Universal films, is very impressive and easily the best in the series. Cushing is as terrific as usual, delivering lines like: “He has a good brain and excellent eyes. I can’t tell you where I got them from but I can assure you that they’re perfect” like no one else can. Peter Woodthorpe plays Zoltan with lip-smacking relish, while Katy Wild is rather affecting as the beggar girl despite having no lines. The score by Don Banks has a decent main theme with a strong hook that stays in the mind. It receives several variations throughout and there are some exciting musical moments, though the score lacks much edge. Looked at critically, The Evil Of Frankenstein doesn’t really do very much, and almost feels like it’s just going through the motions, but its running time flies by and it’s a very hard film to actually dislike.